"Substances" includes any substance that an individual wants to reduce to stop using, so this may include nicotine, or caffeine, for instance, in addition to alcohol or drugs. 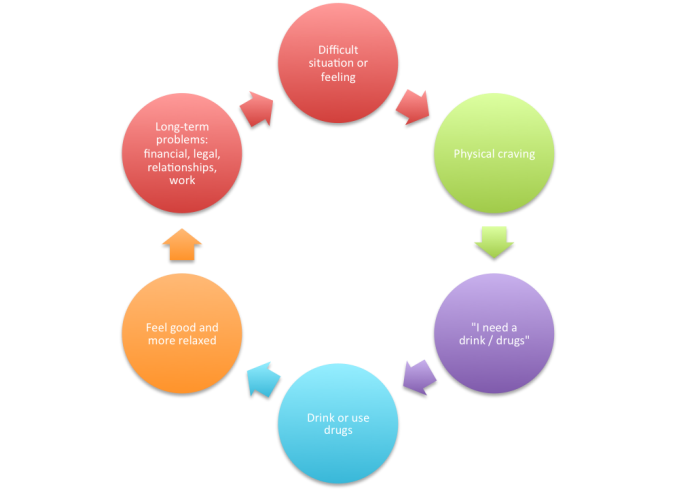 Abusing substances, perhaps alcohol or drugs, often starts as a way of coping with difficult situations or feelings, and finding that the substance helps one feel better and more relaxed. Every time a similar situation comes up, a habit develops. After a while, as an individual starts to rely more and more on alcohol or drugs to help her feel better, other problems emerge as a result. Things like relationship problems, financial problems, legal problems and the inability to keep up with work or study. You might start to feel more depressed, anxious or angry and frustrated. All these things get worse as you continue to drink or use drugs, and so you drink and use more drugs in order to help you feel better, which results in making the problems worse. You must seek help before stopping or cutting down suddenly on drinking or using drugs — you must obtain the advice of an appropriate professional. This might be your primary medical doctor in the first instance. It is potentially dangerous, even life-threatening, and can be a very unpleasant and distressing experience to suddenly stop taking something your body has become accustomed to having. 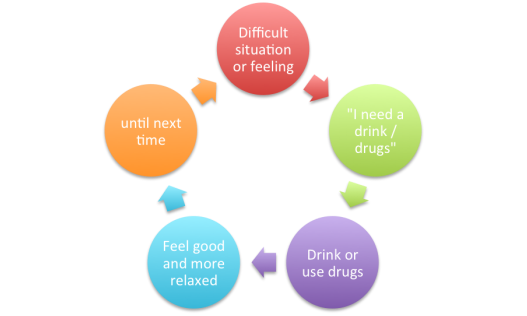 You may require a prescribed detox (whether in hospital or at home), or to reduce your drinking or drug use gradually. What or when are the times when you are more likely to drink or use? If you can see the patterns, then maybe you can do something about those situations and do something different. Think ahead to certain situation? Feeling stressed, anxious, angry, sad....? Understanding the problem is perhaps the easiest part. The most important part of resolving the problem, is being motivated enough to change. Having motivation to not only stop the drinking or drug taking, but making changes that will affect whole lifestyles and friendships. Seek help — others will support you if they see you're committed to making changes. Start with (non-drinking/using) family or friends, and/or your primary medical doctor. For some people though, particularly those closest to you, it might take a while before they believe you mean it this time — they may need to really see your commitment. Talk to them, explain what you hope to achieve, ask for their help and support, then follow it through with committed action. Set goals on what you hope to achieve — You may decide to quit drinking or taking all drugs altogether, but you may have different goals for different substances. You may want to do this with someone who's able to help and support you. Identify your triggers and trigger situations that might make you more likely to drink or use. Support groups — Consider and find out about local Alcoholics Anonymous (AA), Narcotics Anonymous (NA) or other similar and relevant support groups — for yourself and perhaps for your family. Find out how much your drinking, using or spending by using the Substance Use Diary for one week. Drink 6 - 8 glasses of water each day. Start a healthy exercise plan — get advice from a suitably qualified professional. Use medication appropriately and only as prescribed. Avoid social situations where you're more likely to feel tempted and give in to cravings. Consider planning a new social life based around non-substance use activity and environments. Take up a new hobby, attend support group meetings, contact old (non-drinking/using) friends or family. Try out different soft drinks to use as an alternative for those places where you can't avoid being around alcohol. Practice saying "No, I don't drink" or "No, I don't use." Click here for help with developing assertiveness skills. Use imagery and visualization skills to see and feel yourself being successful in various situations. Use the Cravings Diary, at least in the early days and weeks. Use positive self talk — see affirmations. Write down all the reasons you want to stay clean/sober, make copies – carry one around with you, put others in prominent places. Write a letter to someone and let them know why you’ve made this decision. Don't forget to congratulate yourself when you successfully overcome the cravings. You could set up a reward system so you can pamper or treat yourself, initially each successful day, then bigger treats for successful weeks etc. Ensure the treats don't involve temptation! Maybe go out on a family picnic, buy yourself a CD, rent a DVD, or get a good book from the library. Am I using one of those unhelpful thinking habits? Am I seeing things through that negative filter? Is there another way of looking at it? Am I jumping to conclusions about what this person meant? Am I mis-reading between the lines? Is it possible that they didn't mean that? What do I really value in life? What's really important to me? Is it my family and friends, my work, my academic career, enjoying nature, helping others, making a success of my life? What defines that? In what way? Is drinking or using drugs helping me in the service of my values? What would be more helpful? Every time you're faced with a difficult situation, or craving, ask yourself: "will this help me in the service of my values?" Engage in a hobby or other interest — if you don't have one, find one! What have you enjoyed in the past? What have you sometimes thought about doing but not got around to? Use Safe Place Imagery or other visualization exercises. If you have nice memories of drinking, replace them with negative ones - when you were at your worst and felt ashamed. Visualize a drink or drug-free positive future, seeing yourself doing the things you want to do be doing. Do some physical exercise — walk, jog, cycle, swim, dance & sing! Click for "Dealing with Distress"
Click for "Substance Misue Workbook"